You are currently browsing articles tagged Prince Caspian. 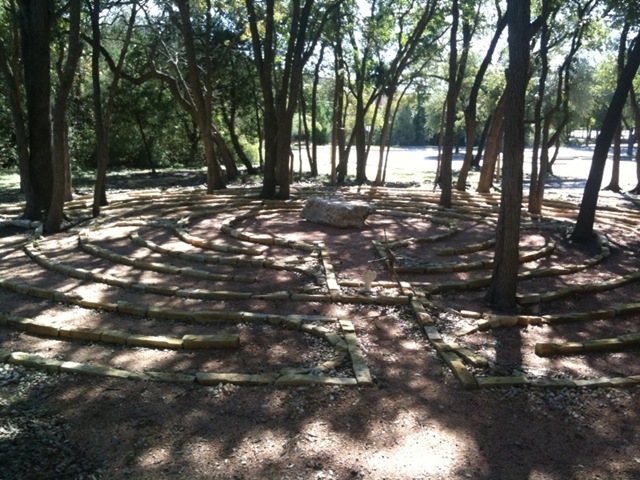 A few days ago, I shared how I came to find myself ready to experience the walking mediation of a labyrinth (see Labyrinth Meditation). I will try to give you some sense of the experience. I share this with some trepidation. Keep in mind, dear reader, this is my experience so it may seem strange in the light before you. I hope you won’t consider me a loon!? Whoops – too late. Ah, well, if I have to be a fool, I will be a fool for Christ. Of course, it may be some of my brothers and sisters in Christ – the fundamental, the pious, the moral; a few good men, that might think I’ve gone AWOL and immediately dispatch the MPs (Ministerial Pharisees) to drag me back to the pew. Fear not friends, I haven’t gone all nuclear or even new age – I’m merely experiencing a new expression of communion with Christ, the holy Son of God. When researching labyrinths in preparation for the visit, one suggestion I uncovered was to traverse the trail meditating on a specific word – something like forgiveness, peace, worship. You want to make sure you eat before you arrive so your word isn’t “hamburger”. Of course if you eat and drink first, you should take care of all the associated post processing so your word doesn’t become a bodily function. It’s exceptionally hard to walk a labyrinth with your legs crossed and it makes you want to hurry which defeats the point. All kidding aside, I found myself at the mouth of the labyrinth considering which word I would digest during this contemplative feast. I had barely opened the menu in my mind to survey my options when the smorgasbord that is the word RENEWAL was served up to me. There has been so much going on in my life and renewal was needed in every department and compartment. But the word was as accurate in the macro-economics of my life as it was in the day-to-day. As I stand, precariously on the pivot point to the see-saw of my life looking at the plank that got me here leading back to the ground and the plank ahead of me stretching upward to the heavens, renewal is the one thing needful. What got me here cannot take me there – further up and further in – Christ, renew me. I implored the Lord to meet me in this place at this time. Then, like a child anxious to ride the big-kid rollercoaster despite fluttering trepidation of heart, I stepped into the labyrinth. I felt a bit awkward at first, like a child wobbling along on its bike just after its father removed the training wheels. But I expected this, so I embraced it (then strangled it and left it gasping for air on an early, outer circuit). One of the brilliant things about the labyrinth is you have enough rings in your path that you can afford one or two just to get your head in the right place – to empty your cup of all the junk our busy world has served up so you can receive fresh, cool water. In fact, that is the very point, to lay aside all the noise of the world for a few minutes so we you hear the voice of the heart and the eternal. Because the labyrinth I chose featured beautiful trees amongst the path, I found myself running my hands across their trunks as I passed by. It was an incongruent experience; attempting to gently caress the contours of their form as a man might caress the face of his beloved or or woman might touch the cheeks of her grandchild, only to be met with the rough, scratchy, unyielding texture of the bark. Even so, it seemed correct so as I continued the course, the practice progressed from this timid touch to a daring dance, a do-si-do circling around and in between my various oaken tango partners. It reminded me of Lucy’s midnight dance with and through the trees to rest with the lion, Aslan in Prince Caspian. I deeply love these stories in the Chronicles or Narnia by C.S. Lewis. The Lord has spoken to me many times as I read and reread these stories to my children. I thought, “Just like Lucy, these trees and this labyrinth are waltzing me to the center to meet my love and Lord, Jesus. It was then that I slid out of the moment, the way you might encounter a temporary reprieve from the drama of a movie or play for a detached thought, and I became aware that I was indeed sliding into renewal. And with that revelation of heart, I ceased to think about it and yielded fully to this ballet of the labyrinth. About half way through the labyrinth, I came across a fallen branch from from one of the trees and picked it up. It looked a lot like a dowsing rod, the type used to divine the location of water. A flood of ideas poured into my head about this. First, I considered how the labyrinth with it’s unicursal path was a type of dowser experience – the path in and out, the participant’s part, like the two forks held by the dowser while the purpose of touching the spiritual, God’s part, was like the outstretched arm in its effort to find water, and water, of course, is a symbol for the spirit. But for me, the experience drilled deeper than the near-surface layers of these general observations. Here I was finding the pure silver water in this labyrinthine dowsing rod of renewal and the surgeon was quick to touch me and cut out this stone beneath this scar tissue on my soul. It was most unexpected. I simply was unaware that there was any more work needed in this area of my soul, but I could not deny the raw, tenderness of this wound now that my Lord was probing it and healing it in new ways. This was clearly renewal. I continued to the center amazed with this encounter as God guided me into renewal, but I will share the rest of this experience in the next post. er amazed with this encounter as God guided me into renewal, but I will share the rest of this experience in the next post.